Richard Jonas has loved but one woman--a woman who belongs to his brother. Refusing to suffer any longer, he evades his family in order to barricade his heart from unrequited love. While attending a friend's summer party, Richard's approach to love is changed after he shares a passionate and life-altering kiss with a vibrant and mysterious woman. Believing he was incapable of loving again, Richard finds himself tempted by a young lady determined to marry his best friend. Gemma Reed has not been treated kindly by the ton. Often disregarded for her appearance and interests unlike those of a proper lady, Gemma heads to a house party to win the heart of Lord Westfield, the man she's loved for years. But her plan is set off course by the tempting and intriguing, Richard Jonas. A chance meeting creates a new path for Richard and Gemma to forge-- but can two people, scorned and shunned by those they've loved from afar, let down their guards to find true happiness? Gemma Reed seems like a woman I would really get along with! Unconventional to say the least. I liked her very much! She is now, and has been, in love with her best friends brother, Lord Robert Westfield. She is invited to a house party given by the family. She is hoping that this will be the perfect time to tell him of her feelings. Miss Reed finds herself noticing a friend of Roberts and starts to think maybe he could help her. Long time friend of Lord Westfield Mr. Richard Jonas joins this house party to avoid his own relatives. One in particular that he loved and lost. He notices Miss Reed trying to get Robert's attention. But he also notices that she is awkward and shy. He feels particularly sorry for her after a rather disastrous turn at the pianoforte. He tries to ease her awkwardness by speaking of things that are not quite appropriate, but still, he does try. The writing in this book is refreshing. The characters are down to earth people, people you would like to talk to, to be friends with. The story shows what love really is as opposed to what we think it is, until you know love, you won't "know." you know? Lol I felt that Gemma, like so many of us, never gives herself enough credit. Though it is hard with a mother that is painfully honest, knows her daughters faults, yet still pushes Gemma to do the things she is not good at. The flow of this story was great, keeping me completely involved until the end. Fantastic story with a great ending. I will certainly read this one again! This was a very entertaining read that kept me hook turning the pages. What I really liked about this story is that it is really down to earth. She gives you characters you can relate to that are again just like me. Gemma is different from most lady she is special she wants a man who will let her be who she is and not a trophy on some gentleman arm with little brains and no say. The ton hasn’t not been kind to this wonderful lady she is outspoken, has book learning, she isn’t pretty and most would call her somewhat ugly. This will be her third season with still not a husband in site. She has her sights set on her best friend’s brother who has been the only male to be kind to her. She doesn’t have the best of luck or the best of timing. She gets herself into a few messes and has a hard time getting out of them. On a chance meeting with a man she has never seen they come to odds and words fly along with a few sparks. Richard sees a women out alone which is not done. He questions her they both end up with their foot in their mouth. Richard would dearly love to have their tongues replace their feet. He grabs her and lays a powerful kiss on her lips. One kiss has her rethinking what she wants in life should she stay with her plan and marry the man she loves or does she love him at all? Richard has his own demons he heart belongs to another or is he rethinking maybe he heart was never in it. The author gives a wonderful plot which holds a powerful message. Sometimes what we think we want we really do not. Maybe the love one has is really just an affection of the respect they show us. Gemma and Richard have to work this out and deal with the fallout if they ever get caught alone together. Gemma was really born before her time in a time where a woman isn’t much more than an object to be seen and not heard. You don’t have to be the best looking but the best on the inside where it counts to really find love. I found this author to be a refreshing delight as she brings you real people with real issues. There are misunderstandings that must work out as the author puts a few twists in their way. It is a short read one I read at one setting it truly was a great read that kept me entertained. This is the first book I have read from this author but I enjoyed it so much I went a bought a few more of hers. I hope you give this author a try I am sure you will enjoy her historical reads as much as I have. Mocked by the ton for most of her life, Gemma Reed seems to not care as she’s loved only one man since her debut. With a house party is thrown so this gentleman can find a wife before his father’s death, Gemma gathers the courage to tell him how she feels. When the love of his life marries his brother, Richard Jonas becomes the ultimate rake. Evading his family Richard attends his friend’s house party where he seems to always be in the wrong place at the wrong time. Or so it would seem. Fate seems to have other ideas for these unrequited lovers. Or does someone in the household have a hand in them being constantly thrown together? Despite the fact that Richard thinks Gemma is scheming to trap his friend for wealth and a title or that Gemma thinks Richard is a rake and drinks too much, fireworks fly between these two. Can Gemma break through the walls Richard has erected around his heart? Can Richard show Gemma that his friend is the wrong man for her? Or will the ghost of his former love and her determination that she loves another stand in the way of true love? Another beautiful love story from the talented Christi Caldwell. Ms. Caldwell writes this story in a light-hearted way with a little suspense tied in and as always captivates her audience. Christi Caldwell has done it again. 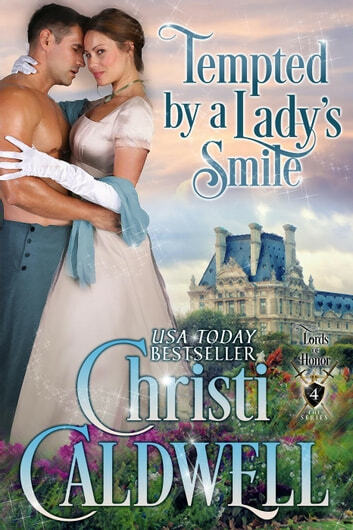 Tempted by a Lady's Smile was everything I have come to expect from Christi and more. The story draws you in from the first page. I could not put the book down. I read the entire story in one sitting. Kudos to Christi CAldwell for another well written and thought out story.